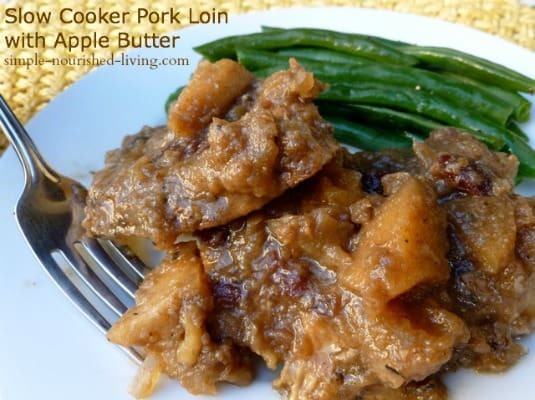 This crock pot pork loin with apple butter, apples, and onions is based on one for skillet pork chops from the The Looneyspoons Collection: Good Food, Good Health, Good Fun! (affiliate link) by Janet Podleski and Greta Podleski. I thought the recipe looked delicious, but decided to try to adapt it for the slow cooker. We really loved this crock pot pork loin with apple butter. It’s a recipe I definitely plan on making again. 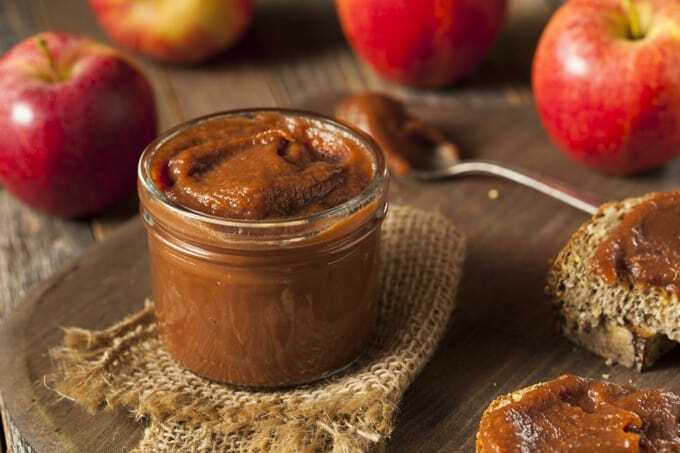 Apple butter is like applesauce, only sweeter and spicier. Look for it with the jams and jellies at your grocery store. According to my calculations, each serving has about 293 calories, *7 Weight Watchers PointsPlus, *9 WW Freestyle SmartPoints. Enjoy! If you’ve made this Slow Cooked Pork Loin with Apple Butter, please give the recipe a star rating below and leave a comment letting me know how you liked it. 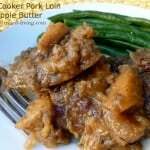 This crock pot pork loin with apple butter is a keeper in my book. A hearty and delicious slow cooker dish perfect for fall. Ideal slow cooker size: 4-Quart. Spray your crock pot with non-stick cooking spray. Place the apples and onion in the crock pot. Place the pork loin on top of the apples and onions. In a mixing bowl, stir together the apple butter, mustard, vinegar, dried cranberries, salt and pepper, until well blended. Spread apple butter mixture over the pork. Cover and cook on LOW 6 to 8, or until the roast is fork tender. Remove the pork from the crock pot and cover it with foil to keep it warm while it rests for 10 minutes. Slice the pork and top with the apple mixture. The cooking time is a difficult one to answer since cooking temps can vary a lot from slow cooker to slow cooker. Slow cookers manufactured in the last 10 years or so cook a lot hotter than the old ones from back in the 1970s/1980s. The size of the slow cooker makes a difference too. Ideally a slow cooker should be at least half full and no more than 2/3 full for optimal cooking. If it is less full your food will cook faster. More full and it will take longer. Hope this helps. Made this and it was very tasty, husband enjoyed it as well!! Hi Danielle, So glad you and your husband liked it! Did this in the pressure cooker, delicious!! Thanks! Hi there! I think this question goes for all not your fantastic recipes. If I want to make a bunch of meals before hand and freeze them… can I put the ingredients in a ziplock bag and sick in freezer until I am ready to cooker? Thanks! Hi Katherine, Yes this technique will work for many of my recipes, particularly most of the ones for the slow cooker. Hope this helps. Good Morning, I noticed you used a 4 quart cooker. If I use a larger crock pot, should I reduce/add more time? Double the sauce? Hi Janet, if you use a larger slow cooker, you’ll want to keep an eye on it because it will probably require less time to be done. Hope this helps.